Climate skepticism is going to eventually meet a rather unsightly death. What it will look like is a contorted, backwards, inverted pile of arguments still desperately trying to account for major changes through non-climate explanations. This may already be happening in the case of the spread of tropical diseases. At the start of this month the surfing world was rocked by one of the greatest tragedies ever. Andy Irons, generally considered to be the #2 surfer of the past decade — second only to super-human surfer Kelly Slater who just won his TENTH world championship — died at age 32 — right in his prime. I’m on the north shore of Hawaii right now, visiting my buddy Brian Bielmann, the veteran surf photographer who was long time close friends with Andy and his wife. The level of shock and disorientation from his death, almost three weeks later, is stunning. Everyone — absolutely everyone — is still talking about it, and trying to make sense of it. THE THREAT IS REAL (AND SPREADING). Here’s the CDC’s up to date map of the world’s regions where dengue is a serious threat. Red markers show recently reported outbreaks. Andy MAY have died from the tropical mosquito-borne illness dengue fever. He may not have. He was in Puerto Rico for a surf contest which he had to pull out of for health reasons. Doctors gave him an I.V. and diagnosed his symptoms as dengue fever. He was flying home to Kauai when he stopped in Dallas, checked into a hotel, and was found dead the next morning. There are potential complications to the story. His drug problems were well known and there were drugs found in his hotel room. The autopsy is still being conducted. But just the possibility that it was dengue says volumes about what’s happening. The reports are everywhere — including on the cover of Discover Magazine this month. Their cover article on the spread of tropical diseases due to global warming features a photo of a mosquito and focuses on the 2005 outbreak of dengue in Brownsville, Texas. And that’s not an isolated incident. Over the past year dengue fever has hit the Florida Keys. 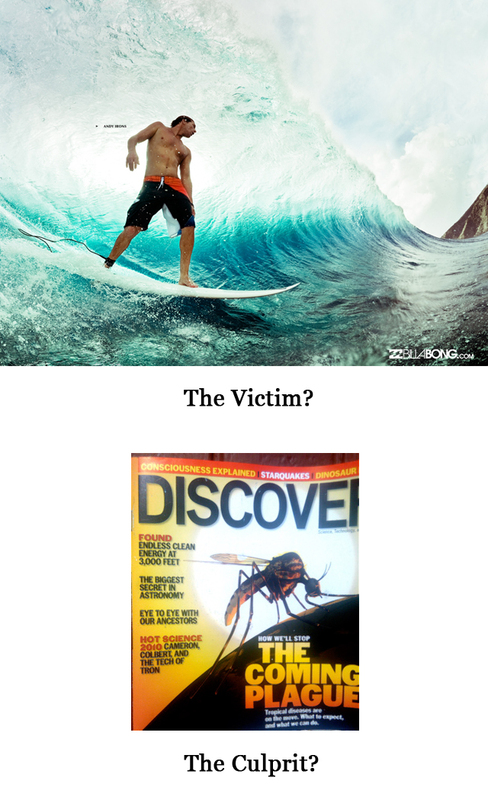 The Centers for Disease Control say, “the first dengue cases acquired in the continental United States outside of the Texas-Mexico border since 1945 and the first locally acquired cases in Florida since 1934.”And most ominously, there was a major outbreak in Puerto Rico at the same time that Andy was there for a surf contest. So it’s not much of a stretch to believe that he did contract the disease, and that perhaps his immune system was already weakened by drug use, making him unusually susceptible to a disease that is usually only rarely fatal — especially for a 32 year old professional athlete. But regardless, even if he wasn’t felled by the tropical disease, many people in southern states are contracting it. And yes, you can still attribute it to other factors such as increased travel or poor sanitation. But that’s what I’m saying about what the death of climate skepticism will eventually look like — flimsy, contorted, warpped-around-on-themselves, upside down, backwards and self-contradictory explanations that end up so hard to accept that you’ll simply have to be “a true believer” to remain a skeptic. At that point, the tables will have completely turned on them. And in the meanwhile, the day after Andy died, my buddy Brian put together this amazing and powerful slide show tribute to him. The show itself is beautiful, but there’s an enormous story behind it’s making, and behind so many of the individual photos. The Andy Irons Slide Show Tribute Seen Round the World – Veteran surf photographer Brian Beilmann put this slide show together on the day after Andy’s death. He had hoped a few friends would appreciate it. Within days it was on countless website with hundreds of thousands of views around the world. It turned out to be the defining tribute to the legendary surfer, and a presentation that made people see a different side to a complex character who had previously only been presented by the media as a surf bad boy. I sat Brian down last Friday and recorded a lengthy interview in which he told all the details of how and why he made the slide show (in an all-day, grief-driven, obsessive effort the day after he got the news), and of the enormous number of people from around the world who were bowled over by it as it turned out to be the nucleus for everyone’s grief and sorrow. Andy Irons had become known as little more than a bad boy of the surf world. Brian’s slide show revealed a whole different side of him that most people never knew. We’ll be posting the interview somewhere on the internet in the next week or so. I’ll do another post about it then. Stay tuned.